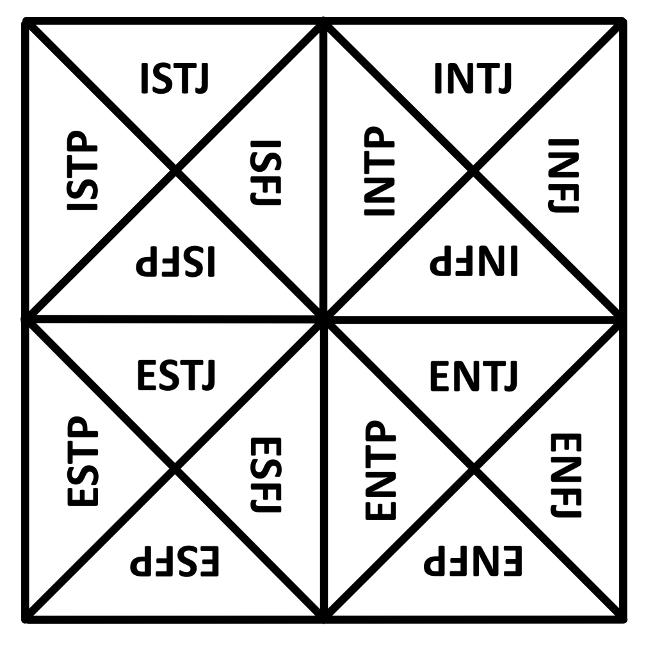 The Myers-Briggs Type Indicator (MBTI) is usually shown as a four-by-four grid of “personality types”. Rebel that I am, here is a triangular version for your personal edification or confusion. Interestingly, some say that there is an association between the MBTI and Astrology. If they are being positive, they are seeing parallels between the personality pigeonholes of the two schemas. If they are being negative, they are saying that both classification systems are pseudo-science rubbish. One might think that this is part of the larger discussion of a person being a “blank slate”, and whether we are determined by nature or nurture or a combination of the two, or are free to be who we desire to be. This entry was posted on September 7, 2018 at 8:31 AM and is filed under Psychology, sixteenfolds. You can follow any responses to this entry through the RSS 2.0 feed. You can leave a response, or trackback from your own site.